MerriMane is literally "one jacket - all activities - that both you and your children will love". Enough said. You had us at "one jacket"! The designer and owner of MerriMane is Jasmine, a mom of 2 daughters, Lily,6 and Claire,3. Jasmine set out to find a way to make a parent's day-to-day easier while providing a wearable, comfortable, nice-looking jacket that can travel through any activity - school, grocery store, holidays, even those chilly summer nights at the beach or fireworks. Jasmine focused on soft fabrics, easy on/off and layering, machine washable (hallelujah!) and a timeless/classic fashion. She nailed all 4 of the values and product characteristics she set out to accomplish when establishing MerriMane. Trust us, you are not going to find a better jacket for your child/ren! Especially one that checks all of these boxes. We had the opportunity to see and feel the product and really don't have enough nice things to say about them! Lucy and Greer will be rocking them this late summer/fall (delivery is set for August). All of the jackets are made in an incredibly cozy and plush Velveteen Fleece fabric that Jasmine sourced (& sourced!) to make sure it was THE RIGHT fabric to put on any child. We also got to check out the jackets after they had been washed and they honestly looked and felt the exact same as the pre-wash jackets. Applause. MerriMane offers 3 styles in both the Baby and Kids (up to size 7) categories. The "Bloom" - has a sweet floral-patterned ruffle detail which hides the side button closure and hits just below the hip. The "Cruise" has a comfy mock neck collar that is a simple, yet sweet silhouette with an exposed side button closure that sits just below the hip. And the "Traveler" style provides an extra cozy design with a hood (also lined with their signature Velveteen Fleece fabric) that transitions to many different day-to-day activities, seasons and functions. 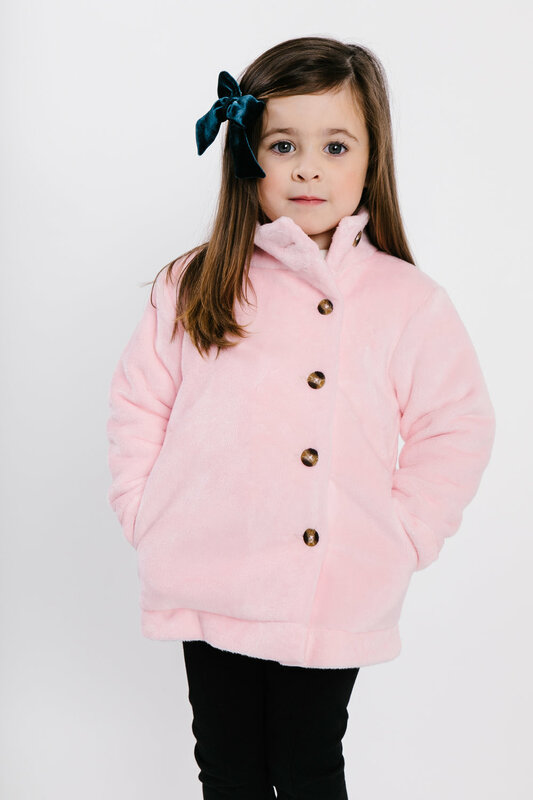 We can assure you that MerriMane will not only become a household name, but will be seen from generation to generation and become a staple for all children's upbringing! We truly believe in this brand and what it stands for. Oh, and can we talk about how sweet the designs are?! To pre-order your MerriMane jacket/s with a 15% discount, head to MerriMane.com and type the promo code JUNEBITSY15. Please note that all orders will be shipped by August 20, 2018. Now that you know all about MerriMane and have sampled their "look", we thought it would be fun to host a GIVEAWAY to celebrate their pre-order launch! What goes best with a MerriMane jacket?! Well, Saltwater Design jewelry and Gells belts and tees for kids, of course! This is a sweet giveaway bundle from 3 of our favorite brands. To get the details on the prizes and how to enter, head to BITSY'S INSTAGRAM FEED!